Students from ADMU bagged 1st place in the business model competition organized by Esquire Financing Inc.
As part of the company's mission of ensuring the success of entrepreneurs by providing financial support and business advisory services, Esquire Financing Inc. organized a business model competition for college students who have the vision to succeed in the business industry through social and environmental business models. "Esquire Financing Inc. remains a strong advocate of entrepreneurship, not just by financing the growth of SMEs, but also by creating avenues for the youth to promote their new business ideas. This Business Plan Competition is just one of the many programs we are dedicated to support in order to achieve our vision," says Esquire Financing President & COO Navin Uttamchandani. Duracinth, an innovative wound healing hydro gel using water hyacinths as the main material won the best business model for Esquire Financing Inc.'s Fueling the Dream competition. Students from Ateneo De Manila University composed of Tristan Joshua Alba, Pierrei Anneliesse Pica, Arlyze Arenas, and Alfonso Luis Serafico have impressed the panel of judges by meeting the triple bottom line framework (people, planet, and profit), which the organizers have set. The students received P100,000 cash prize and P1,000,000 in capital. Esquire Financing Inc. executives also assured guidance and assistance in every step of the way for the students to be successful in their startup business. The selected panel of judges for the final judging includes AIM professor Richard Cruz, SERDEF's Special Projects Committee Member Dr. Eduardo Canela, Association of Development Financing Institutions in Asia and the Pacific (ADFIAP) Knowledge Management Head Enrique Florencio, GoNegosyo's Programs Development Manager John Paul Uminga, and EFI's Chairman & CEO Rajan Uttamchandani. With the success of the recently concluded contest, Esquire Financing Inc. plans to open another competition with wider reach to help and encourage aspiring young entrepreneurs in their vision to succeed in the business industry. 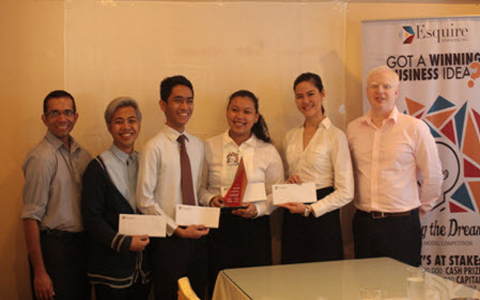 Photo shows Durancinth, winning team of 'Fueling the Dream,' getting the cash prize during the press luncheon held at the Korea Garden Restaurant:(From left to right) EFI CFO Sandeep Chandiramani, Alfonso Luis Serafico, Tristan Joshua Alba, Arlyze Arenas, Pierrei Anneliesse Pica, and EFI President/COO Navin Uttamchandani.